If you are like me, and love smoky flavors, then you MUST make these Smokehouse Burgers! I was searching for a good, flavorful burger recipe and stumbled on the original recipe for these burgers the other day. Of course, I tweaked them to my standards. With my tweaks I immediately fell in love with them. I've made them several times since discovering them. I wanted to share these with you, because I think they would be an awesome burger to serve all of your smoky burger lovers! Can I use liquid smoke in burgers? Yes! Liquid smoke (I like hickory and mesquite flavors) adds a lovely smoky profile to these hamburgers without the process of smoking them! It gives them just the right amount of smokiness to play against the spice of the chipotle peppers and it's very easy to use. What kind of ground beef should I use for Smokehouse Burgers? Let's talk ground beef for this Smokehouse Burger recipe. If you are eating healthy and want to keep the burgers lean, start with lean ground beef (90% lean/10% fat). However, I prefer using a ground beef mixture with just a tad more fat to help keep the burgers moist. I like an 85% lean/15% fat mix. The only time I opt for lean ground beef with a tad more fat in recipes, is when I make burgers. On Allrecipes, where I found the original recipe, many reviewers found the burger mixture to be too wet. This caused their burgers to fall apart as they cooked. To remedy this, I replaced the fresh grated onion with dried onion and the garlic with garlic powder. My mixture was perfect. Not to dry nor wet and it held together nicely. As for the liquid smoke, I like hickory flavor in these Smokehouse Burgers, but feel free to use whatever flavor of liquid smoke you prefer. Just mix the liquid smoke into the burger meat with the other seasonings before you shape into patties. Two words...burger press. Can I just tell you how much I love, love, love this burger press I picked up at an outdoor store last year? I bought this Charcoal Companion® Double Burger Press on a whim, not knowing whether I would like it or not...but let me tell you, it is wonderful. It shapes the burgers perfectly, sizing them for you and leaving a very cool indentation in each one that prevents the meat from puffing up when cooked leaving you with flat burgers! I won't make burgers without it anymore! 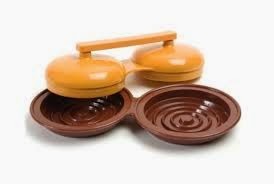 If you don't have a burger press like this one, no worries. You can shape your burgers by hand, adding a small divot or dimple in the middle of each one, on one side of the formed patty. This will help keep your burgers flat when cooking and help to reduce shrinkage. Keep your ground beef cold. You can form your burgers ahead of time and refrigerate until ready to grill. Place the cold burgers on the grill to cook. Do not overmix the ground beef and the seasonings. Cook burgers on a lower temperature grill to help keep them from shrinking. Cook burgers to an internal temperature of 160 degrees F. Check out this chart for safe minimal temperatures from the USDA for more information. 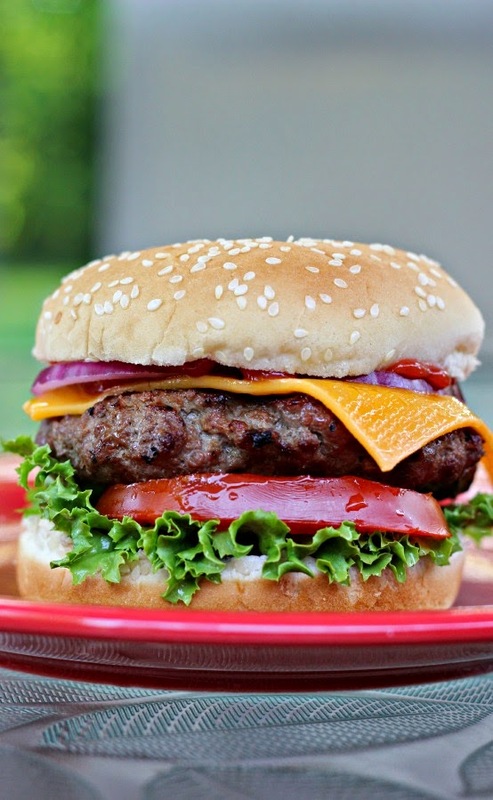 Allow burgers to rest 5-10 minutes before eating, to help the juices redistribute and keep the patty moist. You can omit the chipotle chile in adobo sauce if you're not a fan of spice and still have a delicious smoky burger, thanks to the liquid smoke! I realize, all dressed up in it's Sunday best with cheese, lettuce, tomato, ketchup, and onion, this burger is quite a few calories. It's a splurge meal that is worthy of enjoying, IMHO. How can you make this more diet friendly? I am loving this grilling weather right now! And I am all about burgers! From this wonderful Smokehouse burger to my Cordon Bleu Burger...my grill has been busy! It's also been nice enough for us to enjoy evenings eating dinner on the patio! Love it!! Soon enough, the bugs will be too bothersome to eat outdoors, but after the long winter we had this year, I am trying to get as much outdoor time as I can handle! Shape into 6 big patties ( I use burger press) and place on tray. Cover with plastic wrap and allow to sit in fridge for about 30 minutes. If forming by hand, make sure to put a little divot in the center of each burger to prevent "puffing" when it cooks. Heat grill to medium. 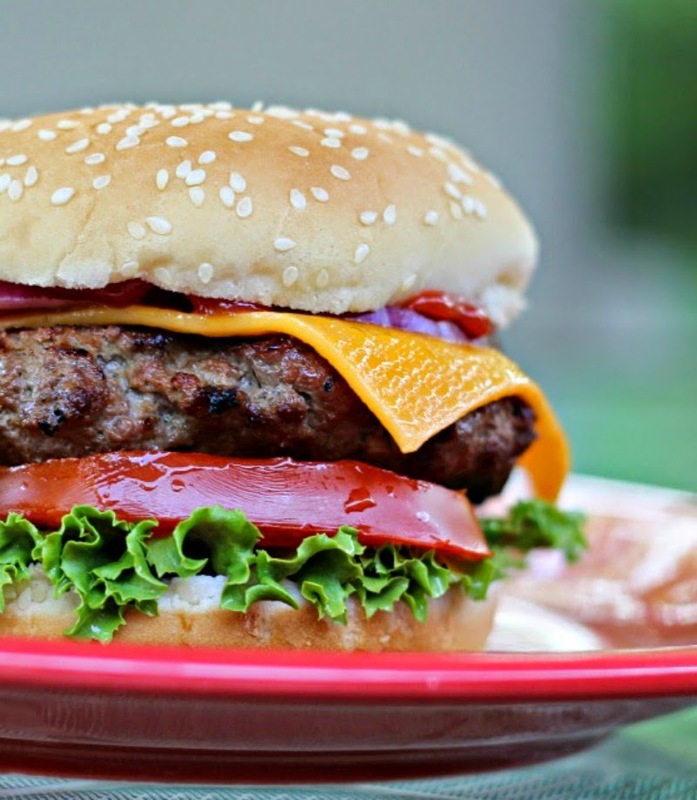 Remove patties from fridge and grill until meat is done all the way through and a meat thermometer inserted into the center of the burger reads 160 degrees F.* Allow burgers to sit, once done, loosely draped in foil for 5 to 10 minutes before serving. If you love Smokehouse Burgers please pin to Pinterest and share on your social media! I am not much of a burger eater either, but if I had one that looked like this I would be eating it in a heartbeat! Great post and awesome photos Renee! This looks absolutely delicious! Love the liquid smoke. Such great flavor! Hooooray for grilling! That burger looks totally perfect. Josh would ADORE! Your burger looks juicy and so irresistible! That looks absolutely delicious! I wholeheartedly agree - if you are going to splurge on a burger - best to make it yourself and fill it full of great ingredients! I don't eat burgers very often myself either but you have definitely put me in the mood for this one! What a fabulous recipe for a wonderfully flavorful burger ! I love going out to order Smokehouse burgers and am so glad I now have a recipe to try at home, for half the cost!! !